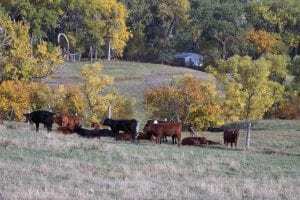 As fall weather approaches, ranchers are planning to bring cattle in off of summer grazing pastures and prepare for weaning. This gives an opportunity to handle these cattle and administer animal health products as a part of a preventative herd health strategy. Product usage and management strategies that are implemented are often decided after a discussion with the local veterinarian. In 2017, Fike et al. published survey findings after asking cow/calf veterinarians about their recommendations for producers. Results (n=148) came from 35 states in the US and three Canadian provinces. Responses depicted common trends despite dealing with operations that vary in size, terrain, climate, and management. It was evident from this survey that vaccine usage to avoid infectious spread of disease within the herd is a very important management practice recommended for cow/calf operations. For calves, the three times frames for vaccine administration were broken out as branding time (2-4 months of age), before weaning, and post weaning. Branding. The most common antigen recommendations were a multivalent clostridial vaccine followed by IBR, BRSV, PI3, BVD type 1, and BVD type 2 respectively. Modified Live Viral (MLV) vaccines were suggested by 88% of responding veterinarians. Calfhood implants were recommended (75% of respondents) as well. Pre-weaning. The most common recommendations shifted slightly for processing pre-weaning: IBR, BRSV, BVD Type 1, BVD Type 2, PI3, Multivalent clostridial, and Manheimia haemolytica, respectively, were the most common antigens at this time. Use of MLV vaccines were recommended by 90%. De-wormers were recommended prior to weaning (76%), and the most common mode of application was injectable products (74%). Post-weaning recommendations included the same antigens as pre-weaning but MLV vaccines were recommended by 93% of veterinarians. Veterinarians were also asked about the type of weaning protocol they would recommend. Fence-line weaning was recommended by 57% of respondents, and 64% of veterinarians recommended a certain number of days between weaning and selling of the animals. With proper facilities, 90% of veterinarians recommend ranchers bunk break cattle before marketing. All responding veterinarians indicated that nutrition for the calf during the preconditioning and weaning period is important to extremely important. Ultimately, the Veterinary Client Patient Relationship is critically important in determining which management strategy is correct on your operation. Timing and product selection are often tailored to fit each unique operation to ensure maximum efficacy. The ultimate goal is to ensure herd health and produce calves that will thrive.